Ruka: That's right... 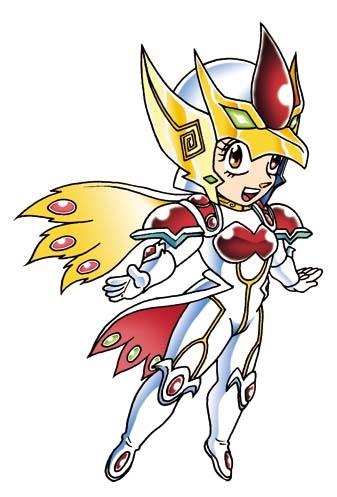 I AM ZERO! Synopsis: Finally, it’s the day of the competition. Everything is all set, but Ruka does still need to hide her identity, which has been taken care of by Isumi via a mask. 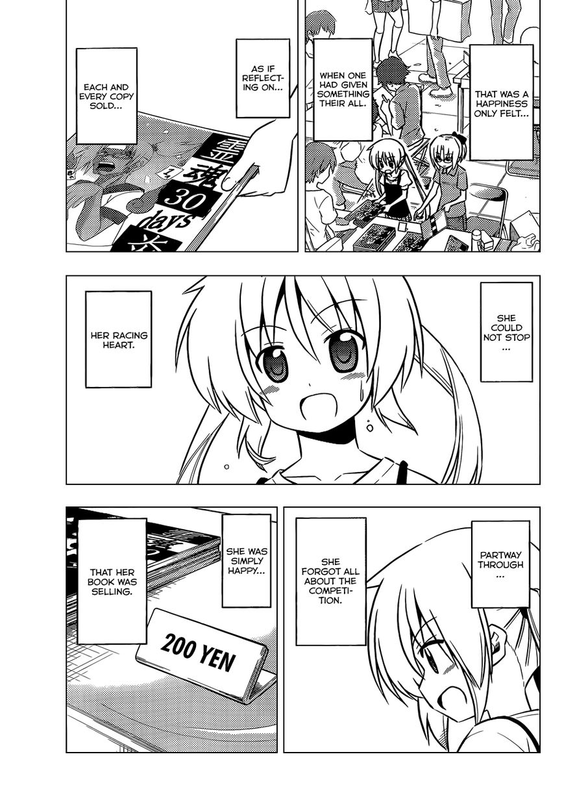 Ruka appears before Nagi and company in epic fashion and declares the rules of the competition: 100 books each and whoever sells the most wins. Ayumu wonders where Hinagiku and Hayate are, but it seems they’re stuck in traffic because of The Great Tokyo Bay Fireworks Festival and won’t be able to make it for the competition. 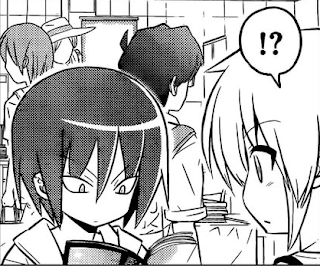 Chiharu asks Kayura which manga she thinks will win to which Kayura replies that she doesn’t really know because they’re both terrible and hard to read, but they’re also both good manga. Nagi reflects on how she got into this competition in the first place because she wanted to become something special with her own hands just like how she saw Ruka as a goddess once before. As the competition begins, Ruka gains the upper hand by making the first sale, but then Maizumi (y’know, the comiket guy from the previous comiket chapter) picks up Nagi’s manga and pretty much says the same thing as Kayura. He basically forces his assistant to buy one and proceeds to spread the word about Nagi’s manga – which undoubtedly helped her quite a lot in this competition. As the day goes on, Nagi begins to understand something: that there is happiness to be found in doing something with the best of your abilities and watching the fruits of your labor. She begins to lose track of the competition and simply lives in the moment. 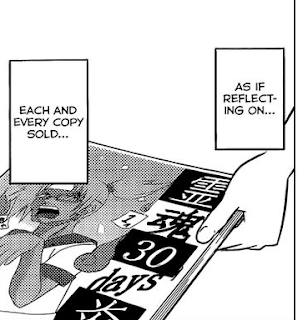 7 hours after the competition began, all 100 of her doujinshi have been sold – which means there’s no way she can lose now. Chiharu then wonders how Ruka is doing and the chapter ends here. 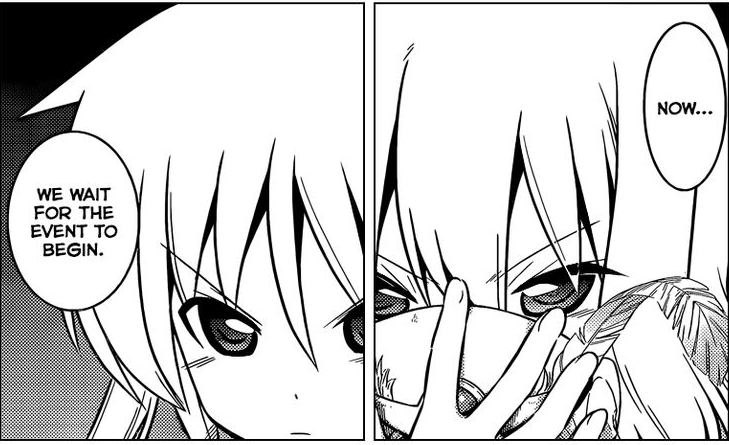 Review: I’m pretty surprised that Hata didn’t throw a curveball and went straight to the competition for this chapter. Even more surprising, the competition itself seems to have ended within this very chapter – and that’s a good thing, in my opinion. After all, this particular story arc has gone on for hundreds of chapters now, and while this may not yet be the end, we are now seeing our first real glimpse that the end is in sight not only for this arc, but possibly for this manga as well. One thing that I found odd is that the scene from Heaven Is A Place On Earth wherein Ruka and Nagi are happily selling doujinshi together was nowhere to be found in this chapter – but that’s not really a complaint. Nagi was drawn extremely cute throughout this whole chapter. 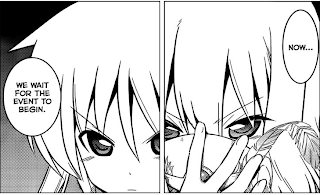 Once again, Hata has filled this chapter with several reminders of how much Nagi’s character has grown throughout this arc, mostly through flashbacks and introspection. I really like the realizations that she had here, because as a creator myself (of OELVN and fiction stories), it’s something that is easily relatable to me. I’ve been into creating visual novels just before mikey of ATP projects and long before current OELVN giants such as SakeVisual and 4LS, but unlike them, I never became famous, nor did my works ever attain the kind of recognition that they are enjoying right now. Instead, the stories that I have written seem to be doomed to forever fade into obscurity. Still, there were those brief moments when I received a heartfelt private message or an email from someone who genuinely liked one of my stories, and after all has been said and done, I guess I can honestly say that not all my efforts have been in vain. 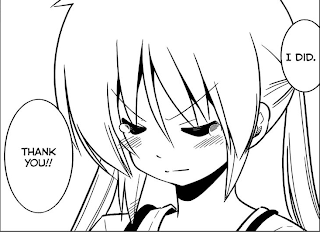 I’d like to think that Nagi felt the same feelings about her manga that I felt when I made my first few crude attempts at creating visual novels back in the day. In any case, I really enjoyed this chapter. It was simple and direct to the point and Nagi looked really cute here. 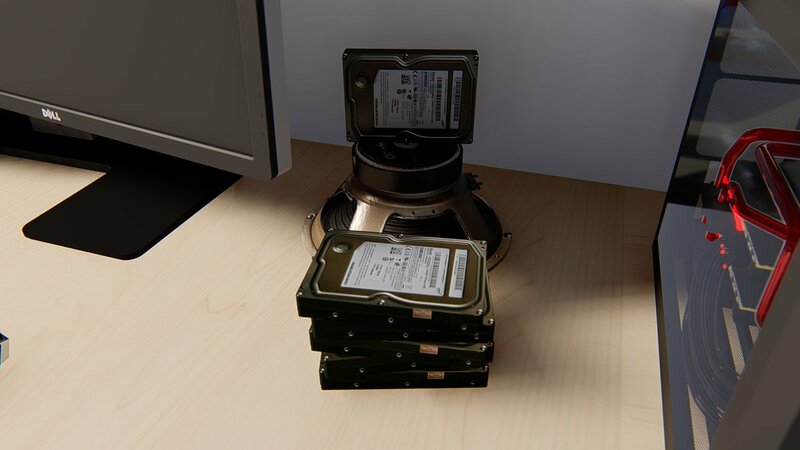 Hah! I just feel the need to state that given what happened in the previous chapter, it looks like I was right that Nagi couldn’t possibly lose here. As for speculations on what happens next, I believe the competition will most likely end in a tie. It would then make sense for Hayate to become relevant to this story again and decide the winner by making his own vote. Which manga is better? Nagi’s or Rukas? More importantly, who will he choose? Yup, it’s Nagi vs Athena all over again. 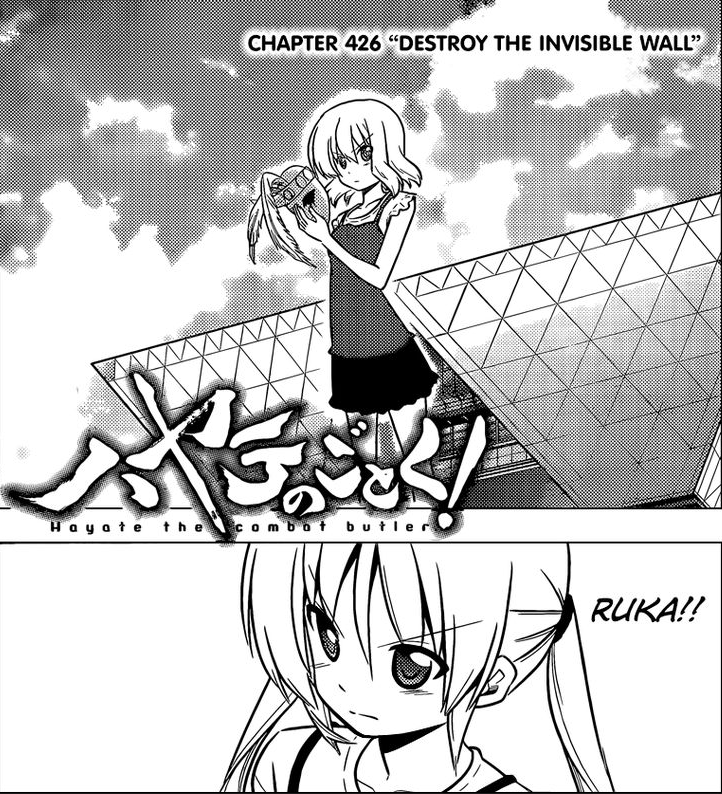 For some reason, I think the supernatural parts of this arc will most likely carry over to the next and possibly final arc of this manga and whatever it is that Hayate and company went to do to make Ruka happy probably has nothing to do with these said supernatural parts. 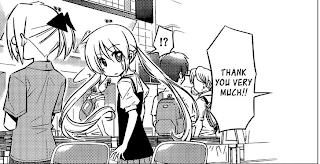 Edit: As AstroNerdBoy correctly points out, Nagi's manga is the same one from Can't Take My Eyes Off You and it is clearly shown in this chapter. Same manga from CTMEOY confirmed!